Why You Need a Soup Kettle - Nisbets Australia Blog - Industry news, trends, recipes and more! Of course, the first question on many people's lips is "what is a soup kettle?". It's pretty simple. A soup kettle is a bench top electric pot which gently warms its contents, similar to a bain marie. Soup kettles generally have a thermostat to help regulate the temperature and a fold-open stainless steel lid so you can easily ladle out hot liquid foods to customers. Sounds simple right? That's because they are. You just fill the inner pot with water, switch on the appliance, set the temperature and then fill with whichever pre-cooked foods you're serving that day. Most soup kettles have a handy adjustable label on the front, so your customers can immediately see the soup of the day as they are walking in the door. Alternatively, you can use either Pavement Boards outside or Specials Boards inside to entice your customers to try out your latest recipes. There's big money in soup, both as street food or as a starter. 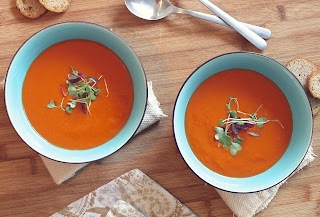 It's very economical to make (the average bowl of soup can cost less than $1 per bowl) and it's easy to add value with either good looking disposable cups or stylish soup bowls. Apuro Soup Kettles have a large 10 litre capacity, meaning that even if you only sold half its contents for the day, you'd easily make back the initial cost of the machine in one day (based on 25 servings at $4 each). Of course, more premium soups or alternative foods can be priced accordingly to improve your margin or reflect the cost of ingredients. Soup kettles really are incredibly versatile. Due to the gentle bain marie-style warming, they are perfect for merchandising other foods such as curry, stew, chilli and bolognese. Seasonal drinks such as mulled wine or cider are also kept at the perfect serving temperature, making a soup kettle ideal all year round, as either your back-of-house soup warmer for starters or as an attractive front-of-house merchandiser to tempt your customers during the winter months.